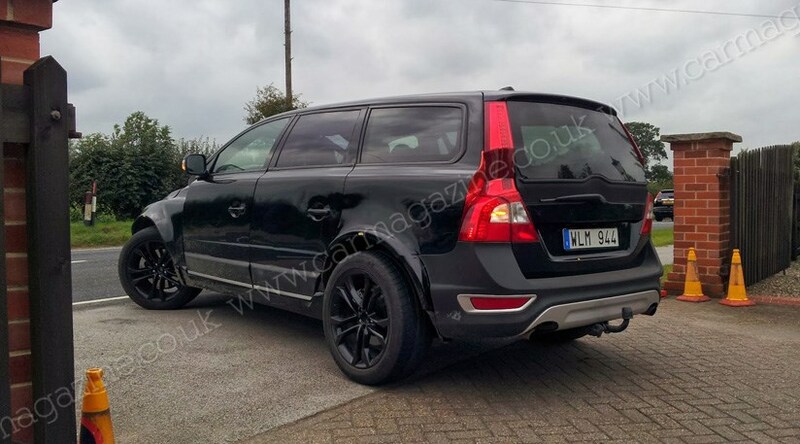 Home Spy Shots Your Spyshots Volvo Volvo SUV mule spied (2013) first glimpse of the new XC90? Volvo SUV mule spied (2013) first glimpse of the new XC90? Volvo could be readying the long-awaited XC90 successor on British roads, under the disguise of a cut-and-shut V70 estate. CAR reader Rory Smith sent us these shots of the mysteriously tall Volvo wagon mule refuelling in Weatherby, West Yorkshire. The comedic-looking test car uses a current-gen V70 bodyshell, stretched outrageously below its pronounced shoulderline to SUV dimensions for comically tall, slab-sided doors. It’s substantially wider, too, while the ride height and wheel arches have been expanded to fit larger wheels, allowing Volvo’s engineers to carry out tuning its new range of high-riding vehicles – like the 2014 XC90 SUV, and the eventual replacement for the XC70 crossover. What do we know about the new Volvo XC90’s oily bits? There’s no work on what’s powering this Sweden-registered test mule, but it has been confirmed that the new XC90, which will take styling cues from the 2013 Volvo Concept Coupe, will use Volvo’s new family of downsized, all-turbo four-cylinder petrol diesel engines. The Drive-e powerplants all displace just 2.0-litres, replacing the outgoing five- and six-cylinder engine range. To produce enough power to shift the weightier Volvo models (of which the XC90 is easily the biggest), Volvo will use higher states of tune and electric motor hybrid propulsion to provide enough go to attempt to match BMW’s X5 and the Range Rover Sport. If a four-cylinder large SUV seems ambitious, don’t forget Audi is prepping four-pot versions of the new Q7, and Mercedes already offers an entry-level four-banger variant of its ML posh-roader. Any word on the new Volvo XC90’s on-board tech? Lots in fact – much of it directed at safety. Volvo is aiming, via its ‘Vision 2020’ target: that no-one will be killed or seriously injured in an accident while driving a new Volvo by the year 2020. New innovations for the XC90 include after-dark pedestrian detection and auto-braking, road-barrier detection and auto-steering avoidance, and even the ability to autonomously park and un-park the vehicle itself – handy given the bulky XC90’s school run brief. Meanwhile, the now-familiar suite of radar-guided cruise control, anti-lane departure systems and blind-spot monitoring will join force to potentially make the new XC90 the safest car ever to take to a British motorway.